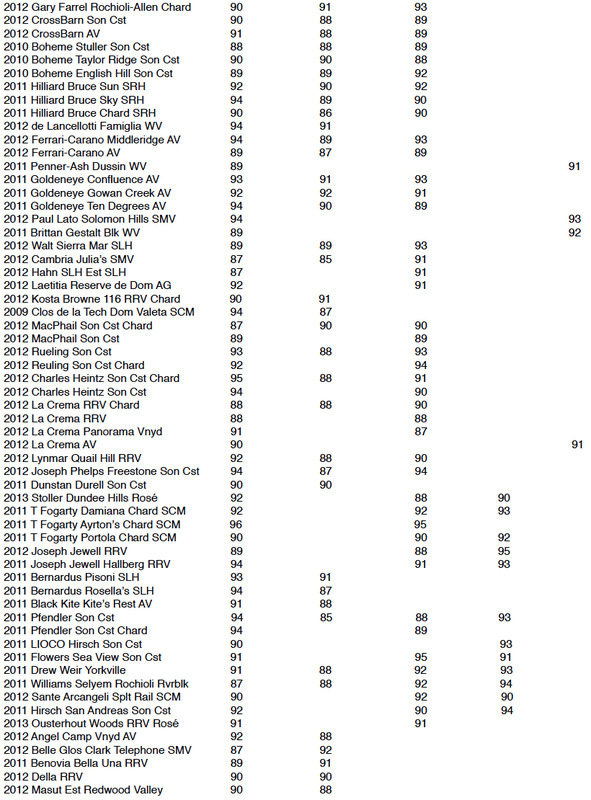 I occasionally look at the scores given to Pinot Noir by major wine publications to see how they compare with my scoring. I finding tasting to be a very personal experience that is often difficult to quantify by a number not surprisingly, a number of discrepancies show up. With so many variable involved, it is surprising how often the scores agree. Goode goes on to point out that trained tasters experience wine differently and that is the crux of the matter whether you consider the score a property of the wine or the taster. The most significant sources of Pinot Noir reviews are the following: The PinotFile, Wine Spectator, The Wine Advocate, The Pinot Report, Wine & Spirits, Vinous - Antonio Galloni, Wine Enthusiast, Connoisseur’s Guide, International Wine Cellar - Steve Tanzer, and Burghound - Allen Meadows. 1. Scores can vary widely for some wines and consistent for others. For example, the 2011 Pfendler Sonoma Coast Pinot Noir had wildly discordant scores that included 85 (WS), 88 (WE), 93 (W&S), and 94 (PinotFile). Scores on the 2011 Williams Selyem Rochioli Riverblock Russian River Valley Pinot Noir were also high variable: 87 (PinotFile), 88 (WS), 92 (WE) and 94 (W&S). On the other hand, the 2012 Felton Road Calvert Central Otago Pinot Noir had more consistent scores of 93 (WS), 91 (WE), 90 (IWC), and 92 (PinotFile). So did the 2012 Siduri Russian River Valley Pinot Noir with scores of 88 (PinotFile), 87 (WS) and 88 (WE). 2. 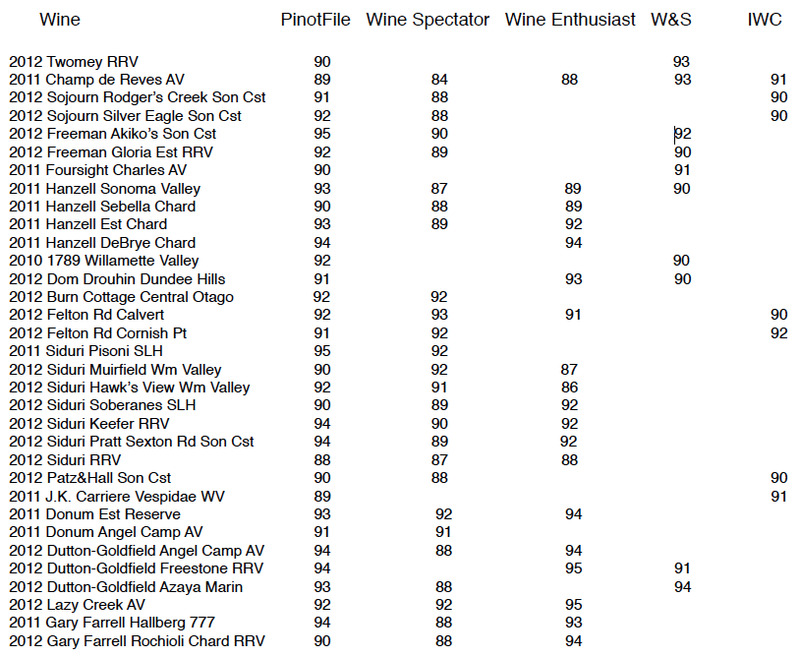 Wine Spectator is surprisingly stingy on scoring some wines and had more lower scores. The score of 88 showed up more often compared to other rating publications. 3. My scores are most consistent with those of the Wine Enthusiast, with many of those wines rated by Steve Heimoff. 4. Scores are subject to so many variables that comparing scores is of little value. Some publications use a single taster, while others use panels with the final review written by one taster. Wines are tasted at different points in time with some reviewed shortly after release and others reviewed 6 months later. Bottle variation is also an important consideration.